Last year, 2017, my garden shocked me with a great surprise! Out of nowhere and for no reason, these big leaves popped out of my compost pile. It didn't take long for me to realize that it was a squash plant, butternut. I had never grown one before, but I did buy them. Of course, everything I didn't eat, such as the seeds, went into the compost. It overwintered outside and grew when the weather warmed up. Actually, several plants grew but I didn't have room for them all. My vegetable garden is only 166 square feet. It is enclosed in a chain link hexagon fence to keep animals away from it. Deer were always eating my vegetables before I enclosed them. I also had several tomato plants pop up. Everything flourished really well. 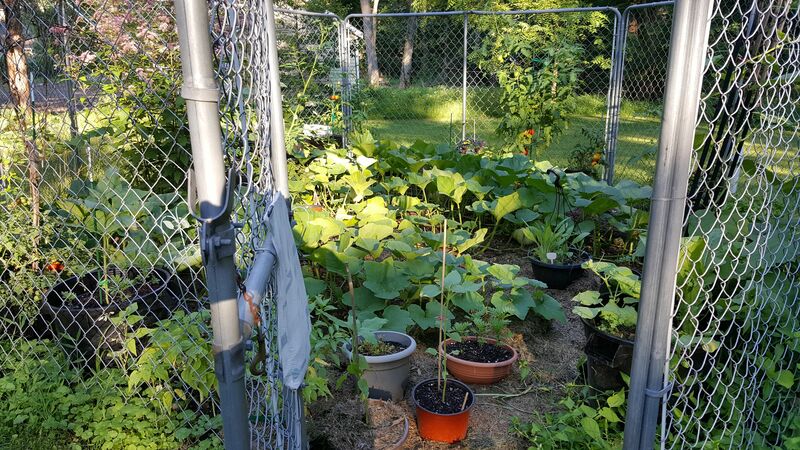 I had more than 20 squashes in that little space. It got really crazy in there! I learned to leave the squashes right in the garden until they were a tan color and quite hard. That's when they are at their sweetest. The inside gets a deep orangie-gold color. We barbecued some on the charcoal grill. I cut the squash into 3 or 4 inch squares, very lightly coated them with olive oil, then drizzled honey on them. We loosely folded aluminum foil around them but left openings at the top, put them on the grill and covered the grill with its dome. They were gorgeous and DELICIOUS! To begin with, the high level of potassium in butternut squash acts as a vasodilator. This keeps the blood vessels open and helps to regulate blood pressure . Having a high level of iron, butternut also improves red blood cell counts that help with blood circulation that oxygenates organ systems. there are 4 types of carotenoids – beta-carotene, alpha-carotene, lutein, and zeaxanthin. Those latter two carotenoids both work directly in the retina to prevent oxidative stress and macular degeneration, while the first two are converted into retinol, which is the form of vitamin A that the body can use. lowering your risk of inflammation in the colon. Fiber can also help scrape excess cholesterol from the body and protect heart health! It is known that pregnant women should eat foods with high levels of folic acid to help prevent birth defects. Here again, butternut squash steps up to the plate and fills it with folic acid as well as other important B vitamins!!! 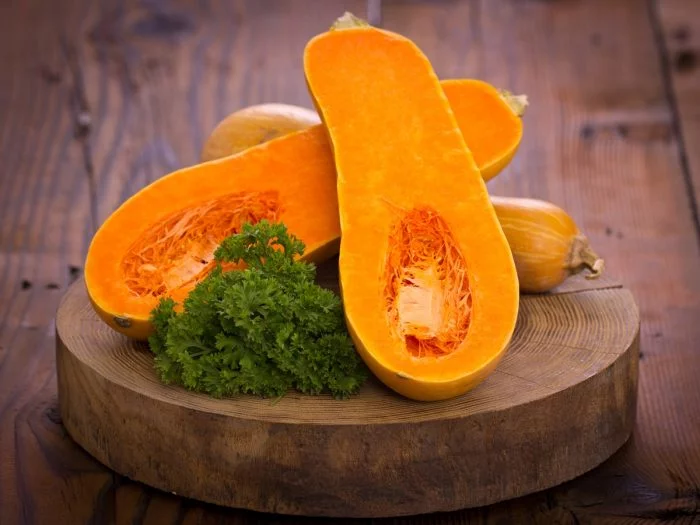 Butternut squash, like many gourds, is rich in minerals, such as potassium, manganese, magnesium, and calcium, all of which can help with the strength and durability of your bones. As you age, adding mineral-rich foods like gourds and squash to your diet is critical to counter the natural effects of aging and the onset of osteoporosis. Along with all these other nutrients, butternut squash boasts large amounts of vitamin C. This helps our immune systems to thrive with healthy white blood cells. Vitamin C also works as an antioxidant in your body and you need Vitamin C to grow and produce new cells. Finally, though by no means, all, the beta-carotene in butternut squash can actually help to block harmful effects of UV radiation. That's amazing! But don't stop using sun block cream! 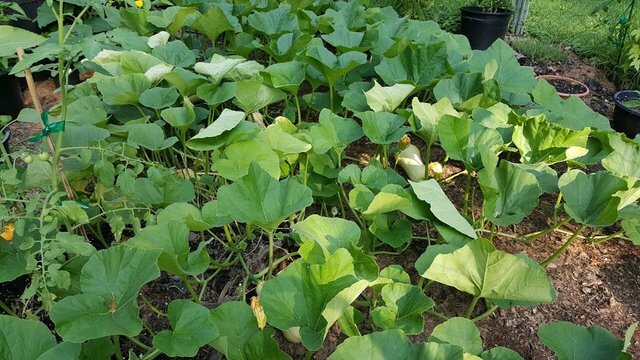 Thanks to the drama of the magical appearance of butternut squash in my garden last year, I learned a lot about this food which I had always taken for granted. So, I planted some this year on one of the days it wasn't snowing... It's still snowing in New Jersey. You have a beautiful garden and well protected too. ;) "Here again, butternut squash steps up to the plate and fills it with folic acid as well as other important B vitamins!!!" - You can tell a writer's passion for their topic when they start throwing out baseball metaphors. Loved this. I found you through the PayitForward contest in which you were featured by @derekfreeman. Congrats. :))) Thank you! I appreciate your appreciation! I gave you an up-vote and will follow you. I'm vegan, so I BBQ vegetables. Sooo good! What's it like in Russia? How awesome to have volunteer butternut squash. I've given you a follow also. Florio, thank you! And I've given you a follow also. I like that "volunteer butternut squash"! And the seeds are natural wormers for chickens. No kidding! How does that work?